Boys like toys. I could empathize with Ralphie in A Christmas Story for wanting that Red Ryder BB-gun. And boys don’t seem to grow up. Jim on his Silver Bullet. A couple of weeks ago a friend of mine called me over to his place to check out his new toy. An E-Bike. Much like an E-book, this thing is a modification of the standard object. It has all the usual things that a bicycle would have but also has a battery that powers a motor that can either let you sail along, throttling it like a motorcycle or set it to call in electric power when your legs are not quite doing the trick. It was a delight to ride. He gave me a brand new helmet that he had that was not a good fit for him but fit me perfectly. Now I had the helmet, all I needed was the bike. 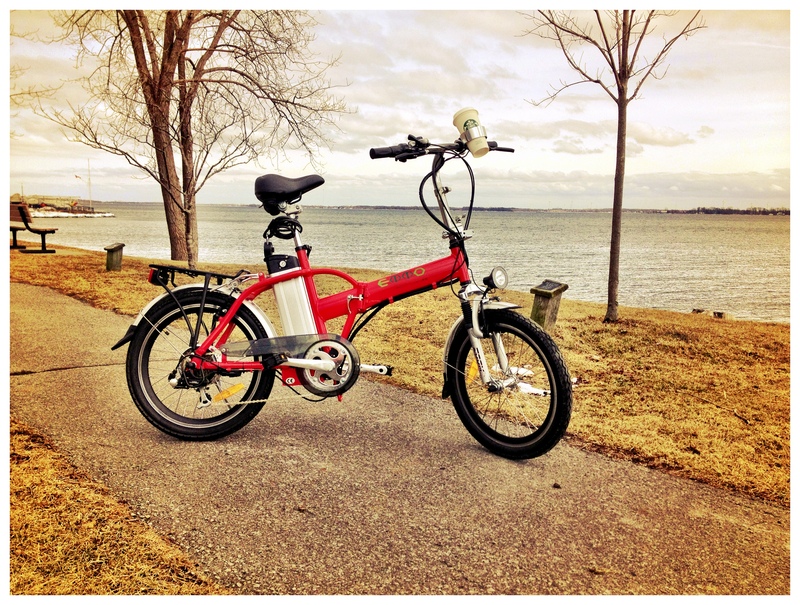 Last weekend I picked up my very own “official, red, folding, EMMO double action six-speed, dual-braked hybrid electric bicycle with a kickstand, bell, rechargeable lithium-ion battery and a Starbucks cup holder right on the handlebar.” I am going to call it my Red Rider. I had been thinking of getting a bike this spring but the whole exercise thing was just a little more than I was looking forward to. It would have been OK on the flat but when there is a hill – well, my old joints and muscles are just not up to it. But this E-bike seemed perfect. If I get tired, I can just throttle up and ride. Easy stuff, right? Well, initially I had to get used to the controls. The throttle, I found, is sensitive. As I was walking the bike through my underground garage I had, unwittingly (the word unwittingly may come up more than once here) left the key in the on position. I accidentally gripped the throttle and the bike took off, wheelie-style, toward a neighbouring car. Luckily I was able to stumble along side and eventually realized that if I just let up on the throttle things would be OK. A close call and I was not even out of the garage. All went well – my crotch will get used to the seat, I hope – until the next day when my sacroiliac joints were complaining and my calves ached. I had not counted on using those muscles which had been sitting (literally) dormant for some time. I realize that this is a good thing in many ways – the bike is not completely a wimp thing – but I also thought that maybe I should do some stretching before I set out the next time. From “Eight stretching exercises for cyclists”. I looked online for stretches for bikers. The nubile, 20-something woman that was demonstrating the stretches looked very good. But I soon recognized that I couldn’t get my maturing body contorted into the stretch position she was showing. I tried. It made me dizzy. On to another YouTube page of stretches – this time done holding the bike. I watched the first minute which involved straddling the front wheel and holding onto the handlebars to stretch. Given my parking lot experience with the throttle, I decided immediately against that one. Eventually I found a stretch where you just lie on the floor and bend your knees up to one side. I will adopt this pre-cycle “stretch” although I am not sure it is stretching anything but the time. The Red Rider folds up and weighs less than 50 pounds. It has a battery that will, apparently, take you up to 40 km. It folds up and fits in the back of my car. I can take it anywhere! I am waiting anxiously now for warmer weather to arrive (it is still cold here in Ontario). I have fantasies of eventually getting my muscles accustomed to the new activity and heading up to the hill on Fort Henry on a June evening to watch the sunset. I can hardly wait to smile innocently as I peddle effortlessly and cruise past others who have given up and are struggling to push their bikes up the hill. To everyone’s relief, I have decided not to purchase lycra bicycle pants. I will ring the bell to warn you. Did I say that it has a bell?? 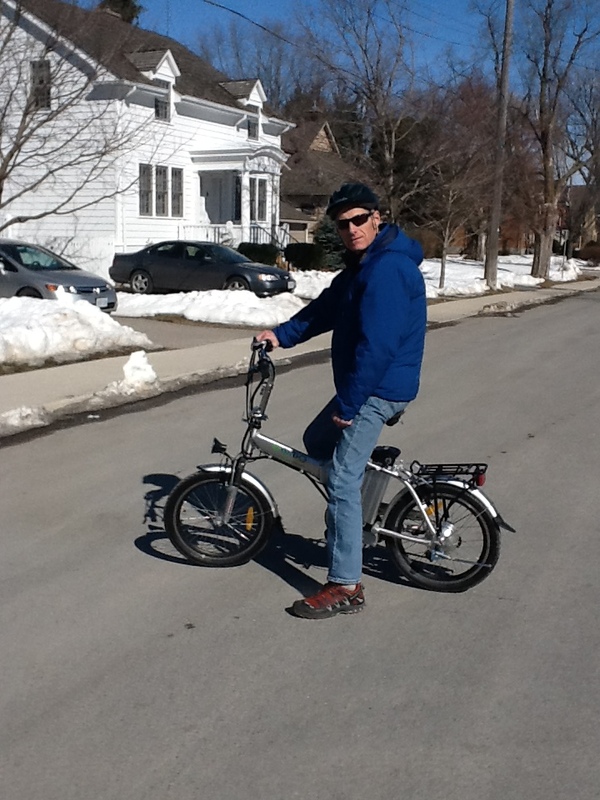 The brakes work well although they are hooked up in the opposite way to usual – the front brake is on the right handle. This may result in a catapult some day but I will try to remember the sequence. And the seat height is quite adjustable. Hilarious!! I really got a kick out this.